Our MERV15 13FP20 and 18FP30 Filter Pans are directly interchangeable with most existing 13″ and 18″ latch-on type dust pans and they add a high percentage of filter area to potentially flawed filter systems. The resulting revived air flow restores cyclone efficiency and reduces filter loading. Use the FGL-6 gear latches (included with the filter pan) to secure a filter pan to the Wynn filters (canisters) or the Oneida filters (canister). 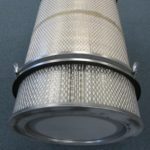 The Filter Pans are designed to share the load, not handle the load and adding 20 or 30 sq. feet to an existing 95 or 110 sq. feet canister makes a huge difference. They should be cleaned down with no more than 60 psi of compressed air just like our NanoFiber filters. All of the above Wynn filters are designed specifically for use with cyclones and have been tested and approved by Bill Pentz. Bill’s website can be accessed here.